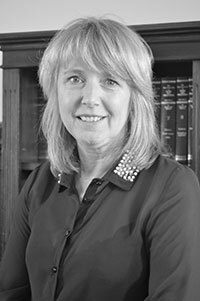 Katie joined the firm as a legal secretary in 1978 became an Associate Member of the Irish Institute of Legal Executives in 1987, and later progressed to Fellow Member of the Irish Institute of Legal Executives in l987. In 2001/2002 Katie studied psychology and IT at HSI Limerick and obtained her Diploma in 2002. During this time Katie has worked and gained vital experience in all areas of the practice. Since 1980 she has worked with John Power Principal Partner, dealing mainly in the area of civil litigation in the Circuit Court, High Court, Supreme Court and European Court. Katie has handled Plaintiff and Defendant work in several areas including personal injuries, probate actions, commercial litigation, commercial arbitration, mediation, contract disputes and debt collection.